Six or so years ago, we began one of our favorite family-time traditions. I purchased a vibrantly colored plate at the Dollar store and declared it to be a special Family Celebration Plate. That original, rather simple plate was quickly replaced by a hand-painted version that displayed our last name and an encouraging verse. Since that time, we have used this plate as a reusable “trophy” to celebrate achievements like the first “dry” day during potty training, receiving a good grade in school, scoring a winning goal, or as an acknowledgement of wise choices and good character lived out. By allowing the “successful” family member to eat dinner off the celebration plate, we were announcing their success to everyone else at the table and encouraging others to give much deserved praise. 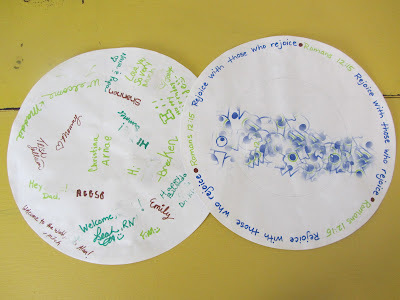 The Hubs and I also take turns awarding each other with the use of the plate allowing the children a chance to see that we have responsibilities, ministries, and passions apart from them. Everyone gets soooooo excited when the plate comes out and is presented with a pile of yummy dinner. After our dinner time prayer, I announce who gets the plate and why it is being presented. Then we all get a chance to congratulate the recipient. 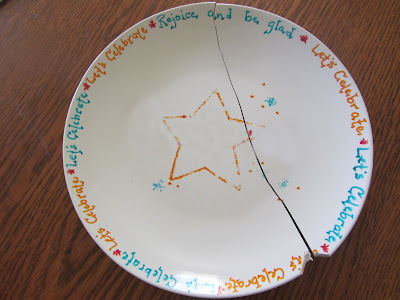 A few weeks ago, while searching through the kitchen cupboards in a careless rush, I knocked into the beloved plate and watched it as it went crashing to the counter in pieces. I was instantly crushed thinking about all the wonderful memories it represented. But, after a few moments of gloom, I realized that a plate is only THAT...a plate...and can be remade to carry on our much loved tradition. Although I could've easily just reproduced the ORIGINAL with another white plate and some paint pens, I chose to take a more durable, professional quality route. This time around, I ordered one of the fabulous memory keepers from MAKit Products. Since 1969, MAKit Products has been preserving cherished memories on their unique Magic Factory melamine ware including plates, bowls, platters, tumblers, and mugs. Children of all ages can create a singular work of art, mail their work to the talented folks at MAKit Products, and receive a personalized keepsake print a few weeks later. In addition to their dishwasher safe, break resistant Magic Factory line, MAKit also offers a complete line of Snappie Products. These simple gift kits allow you to create an instant, one-of-a-kind design and snap it into place with no processing required. Snappie Products includes planters, coasters, key chains, luggage tags, Christmas ornaments, and more. For obvious reasons, I ordered their most popular product...their one-of-a-kind Make A Plate Kit. Each kit comes complete with everything you need to create a unique, 10 inch family memento. Simply, follow the enclosed instructions to decorate one of the drawing sheets, mail your print along with the prepaid certificate in the pre-addressed envelope to MAKit Products, and receive a family keepsake print of your work on a white, melamine plate. I first became aware of these exceptional family keepsakes six years ago with the birth of Super Boy. A friend presented me with a kit in hopes that I might be able to create a tangible reminder of my baby's arrival. I brought all the supplies with me to the hospital and asked all the doctor's, nurses, and eager visitors to sign their name or write a brief message to my little blue bundle. I completed the treasure by adding his foot prints, name, and birthdate. 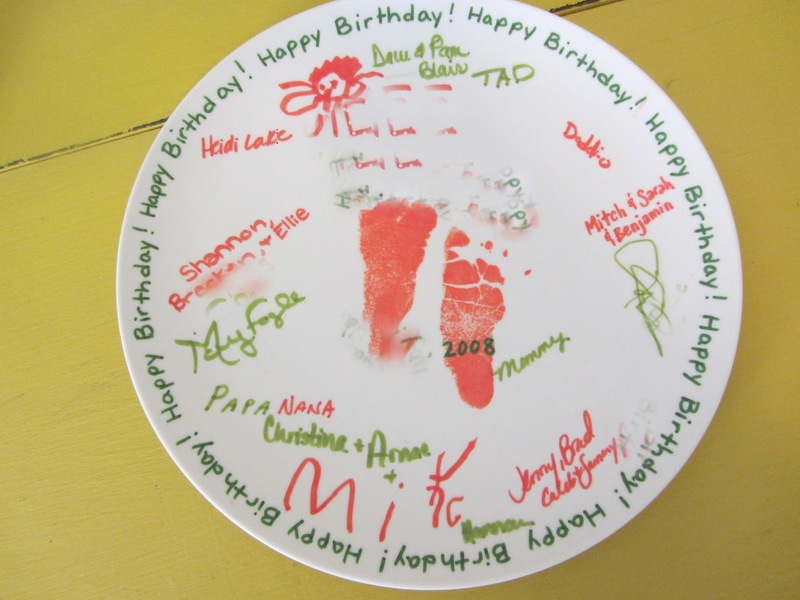 BIRTH-day memory plate. He loves hearing the story of that day and reading off all the names of those who came to celebrate his arrival. Since then, we've added three more BIRTH-day plates to our cupboards. Here is a picture of our latest works in progress. On the left is a special creation honoring The Newbie. And on the right, is the start of Family Celebration Plate III. For the sake of anonymity, all of these plates have been digitally distorted to camouflage names and dates. The thing I most appreciate about these plates are their durability. 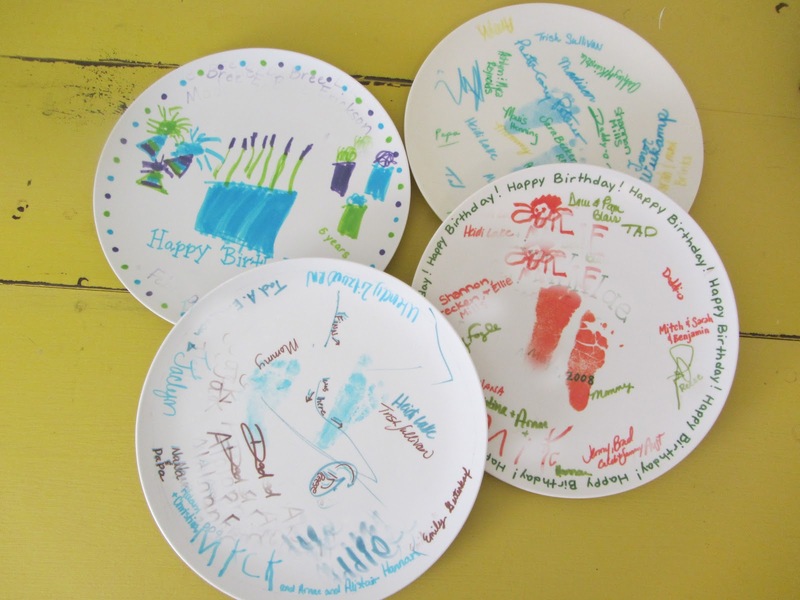 Each melamine plate is nearly indestructible ensuring MANY years of lasting memories. Anxious to make a Family Celebration Plate of your own? Well, you're in luck! The fine folks at MAKit Products would like to give one lucky reader their very own Make-A-Plate-Kit. Just follow the simple instructions from Rafflecopter. There are five chances to register to win. Simply click on the +1 for every entry you wish to make. No purchase necessary to win. Must be 18 years of age and a US resident to enter. 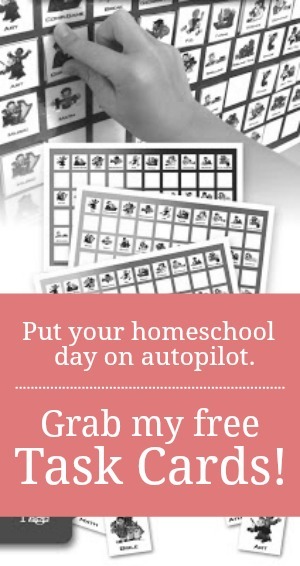 This giveaway is in no way endorsed or affiliated with Facebook. Odds of winning are based on the number of entrees. A winner will be randomly selected using Rafflecopter and will be announced sometime after Friday, April 27, 2012. I like your idea of the birthday plate. I would probably just make one for the whole family to use, since it's a little late for the actual birth feet print. I have seen your plates and know the joy your family gets from using them. I would like to share in that tradition so if I do not win, I think I will have to purchase them. I have been thinking about buying/making a special plate for my kids, as we don't currently have one and I like the idea of using it as a reward for doing something good. I'm sure my kids would love it and would definitely work toward earning the plate to eat off of. I know that my five year old son would love to do this. He is the baby and I know he would love to have something to call his own. First, I would like to make a special, all-purpose special occasion plate. I think it would be cool to make one each Christmas or birthday, too! Thanks for entering this on my site...I just tweeted about it.